1 Using a grater or a food processor to shred cauliflower into crumbles. Reserve 4 cups of the crumbles and store the remainder, if any, in the fridge or freezer for future pizzas. 2 Cook cauliflower in microwave for 8 minutes then allow to cool 10 minutes. 3 Add eggs, 2 cups shredded mozzarella cheese, oregano, basil and garlic powder and stir to combine. 4 Preheat oven to 450 degrees F.
5 Lightly grease 2 baking sheets (or pizza pans); divide mixture into 12 balls. Place balls on sheets and pat each into a thin round about 4 inches wide. Bake in oven 15 minutes until golden brown (the edges might be charred; this is OK). 6 Remove sheets from oven and heat broiler. Top each mini crust with pizza sauce, basil leaves, remaining mozzarella and Parmesan cheeses and tomato slices. 7 Broil pizzas until cheese is melted. Remove from oven and let cool. **You can add any veggies or cheese you like to these pizzas. Don’t be afraid to experiment! I bet they would be good for breakfast instead of toast or potatoes also!! I know most of us greenies are all about organic and local food for our bodies but what about the tools we use to cook and prepare our food? How safe are all of the items we use? Who knows, I have no idea what my pots are made of or where they really came from. I have some expensive ones that were gifts and cheap ones I bought for last minute reasons. I have never really considered what I am cooking in may not be safe at all. When heated, Teflon emits toxic particles and gasses, linked to countless human health illnesses. Aluminum cookware has raised health concerns due to its effect on the human nervous system and is linked to Alzheimer’s Disease. Stainless steel contains both chromium and nickel, (the 18/8 stainless referring to the percentage of each element contained). Both of these substances in the form they are used to make stainless steel are considered toxic to humans, causing a wide range of adverse health effects. I have never actually thought of my pots and pans of cute but an added bonus to purchasing Green Cooking Potsare super cute and colorful! That may not mean much to you but I absolutely love color where ever I can get it so these pots have me way excited. I will say that the pots are moderately priced so to buy a bunch at once may not be a reasonable option for everyone but once your old pots are ready to be recycled you can purchase piece by piece or if you are soon to be married think about putting Green Cooking Pots on your registry. YogaKids Foundations Training is the original program that revolutionized the way yoga is taught to children. Yoga Kids is an excellent idea I think! It is important to teach children about exercise at an early age. Yoga is beneficial for many reasons other than staying in shape. It helps with balance, stress, visualization and teaches children skills they can use throughout their whole lives. Generally gym classes aren’t anywhere near enough exercise and recess only takes place in the earlier grades. Integrating Yoga into daily class schedules can help calm down the students during the day. Yoga Kids is aimed at helping children grow through Yoga. In a country where childhood obesity is at an all time high we should be teaching our children the benefits of yoga and keeping the mine healthy along with the body. 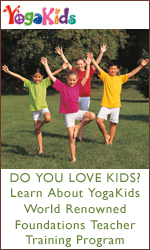 Yoga Kidsoffers training schedules, tools for schools, dvds, games, supplies, teachers, and clothing. Every week YogaKidsoffers a pose of the week and gives detailed instructions on how to do the pose. I love it! This site is amazingly cute and incredibly essential for all children. Have you heard of YogaKids? Do you have yoga in your school? - Protect and Preserve your Plate with EAT CLEANER All Natural Food Wash + Wipes. Tasteless. Odorless. Convenient. Effective. Safe. Eat Cleaneris a company who wholeheartedly believed that food and health go hand and hand. Most would think that is a no brainer but today especially living in America where every fast food joint is pushing “healthy” choices your way it is easy to get confused or lost in the garbage. Eat Cleaner makes it their missing to set the record straight and bring you products that will help you stay safe and healthy. Eat Cleaner’s Clean Kitchen Kit is a great way to get yourself started eating cleaner! The kit includes their fruit and vegetable wash, seafood and poultry wash, on the go fruit and veggie wipes & a wash + dryer kit! The Clean Kitchen wipes are great for moms on the go to wipe snacks down before they get eaten or even at home. It’s important to teach children early about food cleanliness. You could even pack the wipes in their lunches. As for the at home washes I always wash my fruit and veggies obsessively and never really feel they are clean enough that goes double for any poultry or fish we eat. I sometimes hear rising poultry or fish is unnecessary because cooking will kill any bacteria or germs but I don’t buy it. Try the Eat Cleaner Clean Kitchen Kit and tell me how you like it! When it comes to health, we all want to do the right thing but half-truths and inconclusive information can clutter an otherwise logical vision. Our Eat Cleaner mission is to set the record straight on what’s on our plates and help everyone take matters into their own hands. It goes beyond a product. It’s a way of life. 1. Remove the peel and white pith from grapefruits. Cut the grapefruit into pieces and put in a bowl. Then squeeze any remaining fruit to get some juice. Keep the fruit and juice separate. 2. Preheat your oven to 350 degrees and line a broiler pan or baking sheet with foil. 3. Toss chicken, dry mustard, garlic powder, cinnamon, coriander, ginger, pepper and salt in a large bowl until the chicken is well coated. Place on pan in a single layer. Broil the chicken until cooked through, for at least 5 minutes. 4. While the chicken is cooking, mix peanut butter, soy sauce, sugar and hot sauce into the grapefruit juice until smooth. Add the cooked chicken and lettuce; toss to combine. Let sit for 5 minutes to make sure everything is coated then serve.